Intensive conditioning for thoroughbred racehorses is complemented by an equally stringent grooming regimen. The discipline of grooming plays an immense part in several equestrian sports and is an essential component of monitoring a horse’s health and overall condition. 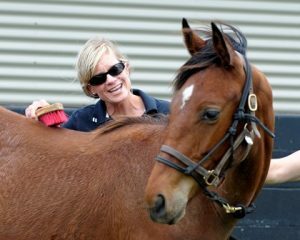 As a practice, racehorse groomers form part of the core team who are responsible for its daily care. A racehorse groomer is tasked with the detailed upkeep of a horse’s general appearance with specific attention to the coat, hooves, tail, mane, and general cleanliness. The purpose of grooming is largely preventive, keeping the horse healthy and monitoring its physical and psychological condition. A horse’s coat is usually brushed, combed, sponged and toweled to improve its luster by the use of a wide range of specialized tools such as curry combs to condition hair, hard brushes to remove dirt and grime, body brushes and stable rubber rags to soothe and condition the coat. When performed by an experienced and intuitive grooming expert, coat care can compose a horse before and after a race. Other preventive care methods involve the protection of the coat using fly spray and botfly picks to prevent botfly infections. Widely considered the most seminal aspect of racehorse grooming, caring for a horse’s hoof by picking out and regular trimming ensures that a racehorse can train and race with comfort. The growth cycle of a horse’s hooves is about 6 weeks, and trimming and clearing pebbles and grime is essential to keeping a racehorse well prepared for the track. Regular hoof care also includes polishing and monitoring hooves for signs of cracking. Trimming for racehorses is a mix of functional and aesthetic removal of hair that may hinder a horse’s movement or vision. Keeping a racehorse’s mane and tail at an acceptable length is achieved by “banging” the tail and thinning or braiding the mane by shortening its length. The acceptable lengths for a racehorse usually vary based on the country where they are being raced.